Collectively trying to salvage our peak mileage training for SCKLM. 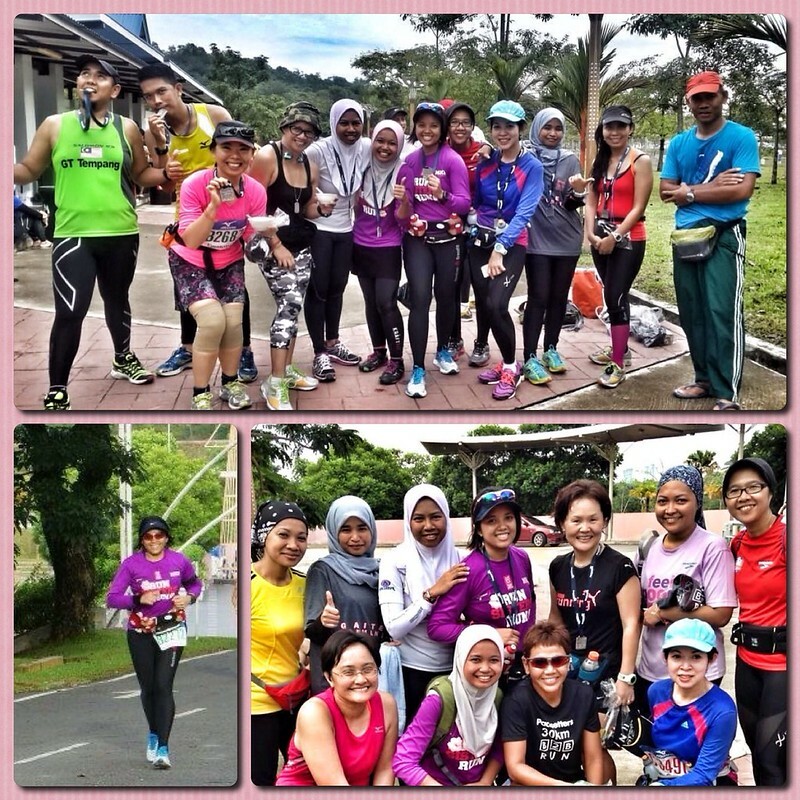 On Sunday, 8th September 2013, my buddies and I joined Back2Basic (B2B) organized by Pacesetters Malaysia, the country’s oldest and most established running club. B2B is a non-competitive running event that allowed runners (who were training for SCKLM due on 29th September) to run long within the relatively safe compound of MAEPS, Malaysia’s largest agro exposition park. The guideline was simple: you can run up to 30km, or do as many loops as you can within 4.5 hours. I was informed that the 1 loop route etched out by Pacesetters was 10km long, and though I was “only” going to run a half marathon in SCKLM, I wanted to have a go at doing 30km, a distance that only most full marathoners would be prepared to do. And so I mentally configured myself to do 3 loops. Ejah, Aniza and I carpooled to Serdang – what fascinated (and maybe slightly frightened) me was that Ejah drove us. Why? She had already run 2 competitive race events on Saturday (IEM Engineer’s 6KM Run in PJ in the morning, and Shape/Men’s Health 12KM in Putrajaya at night! ), so doing this 3rd event that Sunday morning was not only testament to her physical endurance but her mental soundness too! It was still pitch dark when we arrived at MAEPS, nearly 5:30AM. (Trust Malaysians to have a running event that damn early.) The place was quite a maze to drive in and we were lost for a little while after missing a turn or two. Ejah was anxious to start on time. Truth be told, there was no need to start exactly at 5:30, you could start at 6:30 and the organizers wouldn’t even flinch. That’s how flexible B2B was. Heavy rain had occurred the night before, so running B2B was pleasantly cool. Because of the favorable weather, I decided to wear long sleeves for the first time on a run in Malaysia, a decision that wasn’t too shabby. An overcast morning greeted us as the sun rose with visible fog seen misting the hills in the far distance. Running in the MAEPS ground was pleasant, green and serene. After completing 1 loop, rolling hills and all, we found counters of usual Malaysian food fare and drinks awaiting us – our pit stop area, more or less. We really took our time here, there was no pressure to go back out again so soon. I then noticed that my Garmin indicated that we had only finished 7km. What gives? I asked Rustam, president of Pacesetters. “Oh,” he began – “Last night’s rain flooded a bit of our original route, so we had to cut down the loop by about 3km.” A-ha. And so that is how I ended up doing “only” 21km at B2B 30KM. Front & Back of B2B Medal. Thought the choice of Petronas Twin Towers and National Monument on front of medal was interesting choice – considering we didn’t even run by those landmarks!